With a laser power of 1kW and six single laser beams which are arranged coaxially around the material feed, the ProFocus can be used flexibly for deposition welding with powder or wire. The beam generation and the optics of the direct diode laser are positioned in a processing head. In contrast to powder bed-based generative technologies, this system makes it possible to further process any existing semi-finished product and to add geometry elements of any size. Due to the coaxial structure, a processing completely independent of direction is guaranteed. Ultra-HDR cameras ensure a reliable process monitoring. Compared to other generative processes, ProFocus allows users the freedom to decide flexibly on the type of the filler material and to change it within a few seconds. In some cases, different materials and material forms can be used on one component. By using the hot-wire technology, the productivity of the laser can sometimes be doubled (approx. 1kg/h) while processing constantly filigree structures between 1 and 2 mm. Further advantages are the very high powder efficiency as well as the excellent inert gas shielding. 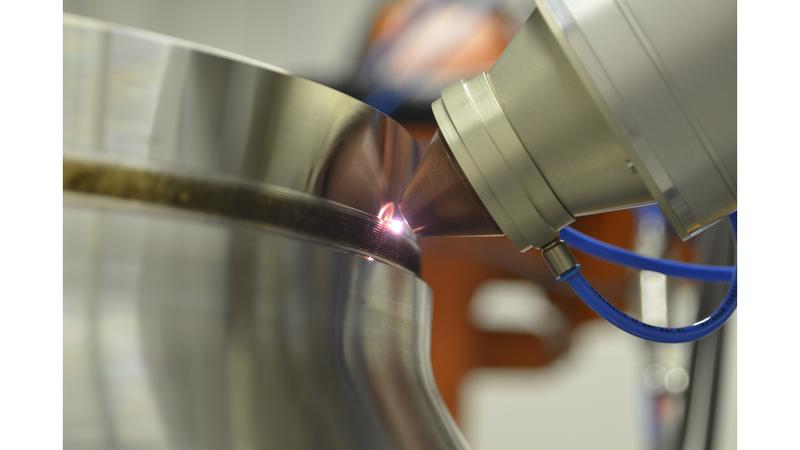 The diode laser ProFocus is used for additive manufacturing, repair welding and coating applications. Among the first successfully realised projects are for example devices for the repair welding of running wheels and for the refurbishment of tools like shovels and straw cutters.